The Cotuit Bass and Bluefish Tournament has become a great annual tradition in Cotuit. All of the proceeds of this event help to fund the Fourth of July Parade and Christmas in Cotuit. All are welcome to join in the fun. You don’t need a boat to take part – you can bring your fish to the weigh-in by boat or car. And you are welcome to join in the fun at the dinner at the Cotuit Highgrounds even if you don’t take part in the Tournament. This year’s Tournament will be held on Saturday, August 10. The captains’ meeting will be held on Friday, August 9, at 5:30 p.m. at Freedom Hall. 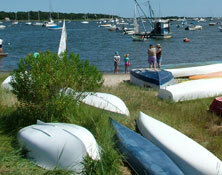 The weigh-in will take place at Cotuit Town Dock on Saturday from 3:00 p.m. to 4:30 p.m. Awards and dinner will be at the Cotuit High Grounds. More information to follow. For further information, contact Henry O’Shaughnessy at 508-776-4034. Click the links below to check out some amazing and fun pictures of previous tournaments!